This title of an old Woody Allen movie came to mind while talking to a mother about an issue with her ten year old daughter. She had established a rule about the amount of “screen” time that would be allowed each day. The question used to be about TV time but life is more complicated these days with iPads, computers and other “screens” to be watched. Mom knew the child had used up her time in the morning but the girl denied it, saying she had been reading when mom thought she was watching. The issue had very quickly turned into a dispute about whether the child was telling the truth – which mom was certain she was not – rather than about her wish to watch something more at that time. In the discussion about this it seemed that “lying” might have been the “crime” which had to be addressed, while more screen time was perhaps only a “misdemeanor.” In any case, mom got caught up in trying to get the child to acknowledge the truth – she had indeed used up her time. This is actually a very familiar situation which arises often as children try to talk their way into getting what they want – or what they don’t want to do. “Go brush your teeth.” “I already brushed them.” “It’s time to do your homework.” “I did my homework on the bus.” “You had candy after lunch.” “You said I could have another piece after dinner.” Children turn into lawyers arguing their case while parents insist on determining the facts of the situation. It is as though parents feel it is necessary to prove they are right and the child wrong – or not truthful – in order to settle the issue at hand. In this discussion, I commented to the mom that children often feel powerless in the face of parental rules and unilateral decisions. So they deny facts, forcefully assert their innocence, or at times throw themselves at the mercy of the court – namely the parent. Part of being a child is to fudge the truth at times, evade the rules and if all else fails, beg and cry. Children need to feel they have put one over on you once in a while. This was especially true for this child who the parents described as needing to be perfect all the time. The mom asked if this meant that she should just have allowed the child to have more screen time even though regulating this was one of their goals as parents. This brought us to another familiar point that arises in these kinds of conflicts. It begins to feel to a parent as though the only alternatives are to enforce your rule in some way or to “give in” to the child. In this case it seemed to mean trying to prove to the child that she was not being truthful in order to justify mom insisting the rule had to be followed. Otherwise she would have to give up the rule. Actually, the seeming “truth” of the situation was not the point at all. The issue was really that the child wanted to watch something on her iPad at that time. To make a decision about that did not require getting into the question of lying or breaking rules. The mom felt if she didn’t prove the child had used up her time there was no basis for not allowing her to watch then. On the other hand mom could have decided to let her watch without reference to the “truth” or the rule. Was it a good idea to let her watch then or not? This gets to the hard part of being a parent. 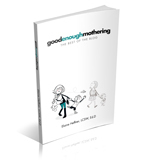 There is no child-rearing manual that can tell you the “right” thing to do. Parents often are afraid that if they go along with the child they give up their authority for the future. But authority as a parent means making decisions about what is best for your child. There is no rule that applies to every situation. In this instance, the mother might have decided it was best to let the child have more time and agreed to it without any discussion about whether she had used up her time earlier. Getting into an argument about who is right is what turns the issue into winning and losing rather than doing what is best. Wanting your own way is not a crime. Children can’t always have what they want – but let’s not get too caught up in arguments about their misdemeanors.